B2B social media is one of the most nettlesome of all social media marketing topics. There are plenty of half-truths and misunderstandings about what, where, why, and how B2B social media works (or doesn’t). I tried to dispel the most common B2B social media myths in this Webinar for Genius.com and Focus. Need more proof? Take your customer email list and find which of them are active where in social media using Flowtown or Gist. Quite the opposite is true. Because there are fewer overall customers, the advocacy impact of an individual customer in B2B is magnified. Further, B2B purchases are often highly researched, making reviews/recommendations/content/search more important. All of these are positively impacted by social media. A 2009 study by MarketingProfs found that all companies, regardless of model and size, are predominately using Twitter, Facebook, YouTube, Blogs, and Linkedin. So, if the tactics are often the same, how does B2C not apply? Further, the core ingredients of social media success: storytelling, humanization, kinship, and purchase intent are not B2B or B2C items. They apply as long as you have employees, customers, and prospective customers. There’s a lot more to social media than Twitter. In fact, if there isn’t any social media chatter about your company presently, it put the onus on you to create content and spur conversations. Having a Facebook page doesn’t provide any social media value per se, and too many companies launch fan pages that are little more than Yellow Pages 2.0. It’s what you do with your Facebook page that counts, and getting “likes” and winning the News Feed are the keys to success. But even when/if you’ve created a winning, ongoing Facebook strategy, recognize that you need to create and support other social media outposts. Putting all your social media eggs in the Facebook basket is akin to building your house on rented land – with a weird landlord that changes his mind all the time. Actually, the opposite is often true. Indeed, you only have 140 characters to provide customer service on Twitter (or slightly more on Facebook), but your customers only have 140 characters to complain! Answering the phone is among the most expensive interactions for any company, and Twitter and Facebook-powered customer support can be financially prudent programs that have the added benefit of being public. Quite the contrary. Social media is among the most measurable of all marketing and communications modalities. The real challenge isn’t whether social media is measurable (it is), it’s what to measure in social media. Your business goals beget your marketing goals, which spawn your social media goals, which breed your social media success metrics. 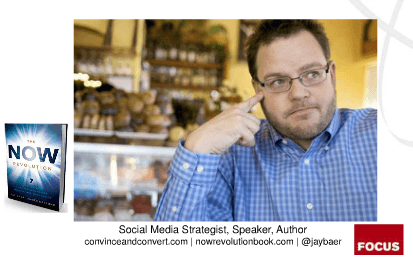 Chapter 7 of The NOW Revolution (my new book with Amber Naslund) is devoted entirely to 25+ social media success metrics, and when each can/should be applied.